Recent years have seen surging international interest in strengthening tax collection in order to finance national development programs. Yet, despite evidence of high and frequently rising inequality across much of the developing world, strengthening the equity of tax systems has usually been low on the agenda. This in part reflects a technical debate: if the ultimate goal is redistribution, is it best achieved through progressive taxation, or through effective and relatively neutral taxation paired with progressive public spending? It also reflects a technical and political constraint: building more progressive tax systems in developing countries is stubbornly difficult, owing to the combination of political resistance by national elites, technical complexity, and an international tax system poorly suited to the needs of developing countries. Despite these debates and challenges, there is a persuasive argument that civil society actors should place a significant advocacy focus on improving the overall equity of tax systems. This is true for technical, political, and strategic reasons. Technically, there is enormous scope for strengthening the progressivity of tax systems, and an urgent need. Politically, building popular trust in tax systems, and in broader state legitimacy, is likely to depend at least in part on being able to demonstrate that even the wealthy are paying their “fair share” – an important goal that also offers a way of “selling” this kind of reform to governments. Strategically, a focus on equity offers an entry point for civil society to build stronger ties to local communities in building grassroots power to push for equity, fairness, and accountability in taxation. Taxes on high-income individuals are frequently highly ineffective. In lower-income countries, personal income tax collection is generally only about a quarter of the levels achieved in OECD countries, while taxation of non-salary incomes – which are central to the incomes of the wealthiest – is particularly ineffective. Property taxes are also poorly collected, thus squandering the possibility of capturing and redistributing rapid increases in property values in many capital cities. Direct tax burdens on low-income groups appear to be much larger than is suggested by official data. In most low-income countries the majority of citizens escape personal income taxation at the national level due to a combination of low incomes, weak administrative capacity, and informality. This can give the impression that the poor “don’t pay direct taxes.” However, the burdens on poor households may nonetheless be large due in part to subnational taxes, or by payments that often fall outside of government budgets but are necessary to access government services. Examples include formal and informal user fees (or reliance on private alternatives to unavailable public services), payments to state officials that do not reach the government budget (‘bribes’, ‘acceleration payments’, ‘revenue leakage’, etc. ), and quasi-voluntary payments to community development associations, traditional authorities, religious institutions, and the like. 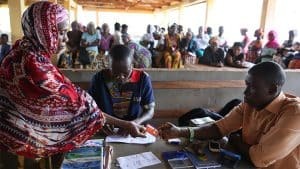 These are increasingly collectively captured under the umbrella term “informal taxation,” with estimates in Sierra Leone and the DRC suggesting these payments may be as large as 10%-20% of the incomes of poor households. The Value-Added tax (VAT) is the primary source of tax revenue but imposes a significant burden on low-income groups. In principle, the VAT can be a key part of progressive fiscal systems by raising revenue to support progressive public spending. However, a growing body of research suggests that VATs impose a significant and immediate burden on the incomes of poor households – and in many low-income countries this burden is not offset by effective transfer programs. VATs may thus increase “cash poverty,” while the overall quality of service provision for low-income groups remains questionable. WHAT ARE THE RIGHT TARGETS FOR REFORM? Historically, much of the advocacy focused on increasing the equity of tax systems in developing countries has been centered on an anti-VAT platform. The argument is straightforward: the VAT is generally a more or less neutral, rather than progressive, tax, and represents a significant burden on the poor through the increased cost of the goods they consume. Yet a focus on anti-VAT advocacy may be misplaced in most cases, for both conceptual and strategic reasons. Conceptually, the problem is not so much that the VAT is bad, but that other taxes might be better. And there is not yet any compelling evidence that strong VATs substantially discourage collection of more progressive taxes. Strategically, there seems no possibility of governments moving significantly away from the VAT, or even significantly reducing rates, given that it is generally the backbone of public revenues. As such, a simple anti-VAT stance may miss more important targets and spend resources on an objective with little chance of success. Strengthen personal income taxes – and not only on wages. Personal income taxes are the most likely source of tax progressivity, and poor collection is the most glaring weakness of developing country tax systems. Plus there appear to be significant, and relatively simple, steps that many countries could take immediately to improve personal income tax collection given adequate political support, or political pressure. Improve property taxation, emphasizing simplicity. Like personal income taxes, property taxes in developing countries are poorly collected but offer relatively straightforward pathways to reform where political support exists. Improving collections in this area can be critical to improving subnational service delivery, which is often particularly important to low-income groups. Better VATs. While VATs will remain a key part of broader fiscal systems, there seems to be a strong case for seeking to avoid taxation of essential goods consumed by low-income households through careful zero rating. Transparency around tax exemptions. The International Monetary Fund and others have long called for greater transparency around tax exemptions, which are frequently poorly targeted and amount to tax giveaways to large corporations and wealthy individuals. Improved taxation of multinational corporations (MNCs). There remain important debates about the extent of potential revenue benefits, but there is little question that substantial revenues could be secured through relatively straightforward reforms and audits, particularly in the extractives sector. Reduce opportunities and incentives for ‘informal taxation’. Curbing regressive informal taxation will require reducing both opportunities and incentives for more predatory and regressive payments through measures including simplification of local tax systems, improved funding of frontline service provision, and improved monitoring (by both government and civil society). Wilson Prichard is assistant professor in the Department of Political Science and School of Global Affairs at the University of Toronto and research director at the International Centre for Tax and Development. This blog was first posted on IBP site.